Examples of pneumatic directional control valves on a manifold. Directional control valves are used in pneumatic systems to direct or stop the flow of compressed air or oil to their appliances. They are probably the most used elements in pneumatic systems, and can be used for example to actuate a cylinder, a larger industrial valve or air tools. The valves can have two or more ports and fulfil various circuit functions. The function and behaviour of the valve can be indicated by a symbol. The symbol however doesn't explain the construction of the valve. 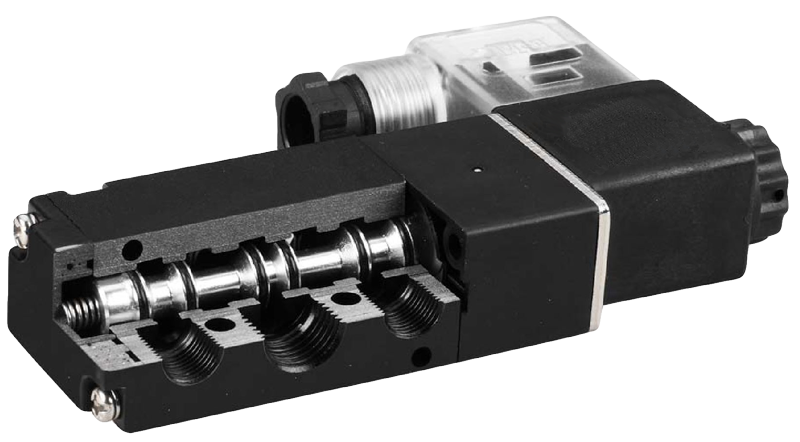 Directional control valves can be actuated by different means, such as manual actuation or solenoid actuation. 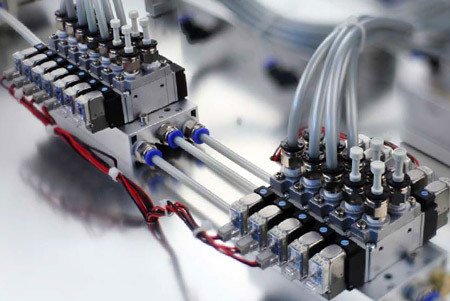 This article focuses on the different directional solenoid valves for pneumatic systems. "Directional control valves are used in pneumatic systems to direct or stop the flow of compressed air to their appliances." Pneumatic solenoid valves generally have a spool design. They consist out of an aluminium body with a cylindrical hole. The different ports of the valve connect to the cylinder. A sliding spool in the cylinder has several seals along its length. By sliding the spool back and forth through the cylinder, different ports can be connected or closed off. To create a sealing with absolutely no leakage, is very difficult with the spool design. Therefore, pneumatic solenoid valves always have a very small (but acceptable) internal leakage. With these types of valves, the air can flow in both directions through the valve. This is called bidirectional. The required force to move the spool can be relatively small; the pressure of the air has limited influence on the required force. Also, the force of the spring in mono stable valves is quite small. As a result, the solenoids usually consume a low amount of power. Because most valves are pilot operated, the required force of the solenoid is even less. Pilot operation (indirect operation) means that the valve uses the air pressure to actuate the valve, the air pressure is controlled by the solenoid. With this design, the solenoid has to deliver a much lower force than the force that is delivered by the air pressure. The valve can be internally piloted or externally piloted. Internally piloted valves use the inlet pressure to actuate the valve, externally piloted valves use a separate channel for the pilot operation. Internally piloted valves require a certain differential pressure of typically 0.1 - 1.5 bar to operate. If the pressure is too low, the valve will not switch state when the solenoid is actuated. Internally piloted valves are not suitable for use in low pressure systems or vacuum applications. Sometimes engineers ask if a pneumatic solenoid valve can be used for other media such as water or oil. The short answer is that it is not recommended. Many pneumatic solenoid valves are internally piloted and vent a minimal amount of air that is required to actuate the valve. A small loss of air into the surroundings is acceptable in most applications, but not in the case of water, oil or other types of media. Furthermore, the valve materials are optimized for use with air. Usually, the valve is made of aluminium parts and NBR or HNBR seals. Other media than air might cause corrosion or other chemical reactions, which can have a negative impact on the lifespan of the valve. Section view of a 5/2-way solenoid valve. In the valve body is a movable spool with seals. By sliding the spool from left to right, different ports on both sides of the valve body are connected or closed off. A mono-stable valve is held by a (pneumatic or coil) spring into its home position. As soon as the valve is actuated (for example by a solenoid), the valve switches to its energized state. When the (electrical) power is released, the valve will return to its home position. These valves are also referred to as 'single acting' solenoid valves. A bi-stable valve can be switched by a momentary operation and will remain in position. So when the operation is stopped, the valve will not return to the initial situation prior to the operation. A bi-stable solenoid valve usually has a solenoid on both ends of the valve. Each solenoid is responsible for switching to a single state. These valves are called 'double acting' solenoid valves. Directional valves are appointed with two numbers. The first number shows how many ports the valve has, and the second number the amount of states. For example, a 2/2-way valve has two ports (in/out) and two states (open/closed). A 5/2-way valve has five ports and two states. Directional valves usually have two, three or five ports. In the following sections, the different types will be explained in more detail. The most common and most simple valve is the 2/2-way valve. It has two ports and two states (open and closed) and is therefore also called shut-off valve. They are used in pneumatic applications where the supply of air must periodically be closed off. 2/2-way valves can be mono-stable or bi-stable. Bi-stable 2/2-way valves usually have one solenoid and are pulse operated to switch state. These valves are also referred to as 'latching'. Mono-stable 2/2-way valves can be normally closed (opens when actuated) or normally open (closes when actuated). The majority of 2/2-way solenoid valves is mono-stable and normally closed. The image below shows the symbol for a normally closed valve. If you want to know more about the symbols for directional valves, a clear explanation is given in the article valve symbols. A 3/2-way valve has three ports and two states. They are used for instance to control a single-acting cylinder. The valve is used to fill the cylinder, but also to vent the cylinder afterwards to realize a new working stroke. Therefore, a valve with two ports would not be sufficient. A third port is required for venting. 3/2-way valves can be mono-stable or bi-stable. Just like 2/2-way valves, mono-stable 3/2-way valves can be normally closed or normally open. The symbol below represent a mono-stable 3/2-way that is normally closed. A 5/2-way valve has five ports and two states. These valves are used for instance to control double acting cylinders. A double acting cylinder requires two outlet ports of the valve. 5/2-way valves can be mono-stable or bi-stable. The before mentioned valves all have two states. It is also possible to have a third state, for example a 5/3-way solenoid valve. The third state is used to stop a double acting cylinder in an intermediate position. These valves are mono stable and return to the centre position when the solenoids are not energized. Two solenoids are used two switch the valve to the other two states. 5/3 valves are available in three variants; with closed centre position, with venting centre position and with pressurized centre position. The closed centre valve is represented by the symbol shown below. Many pneumatic solenoid valves have a standardised flange design to directly mount them to appliances such as a pneumatic actuator. The most common standard is the NAMUR standard (VDI/VDE 3845), a European standard that defines a standard interface to mount directional control valves directly to the rotary actuator. This standard is adopted worldwide. The valves are mounted on the actuator with M5 screws. Actuators produced in the USA have generally #10-24 threads. The valve is provided with two O-rings to seal the port connection between the valve and the actuator. The interface design allows two mounting positions of the valve by rotating the valve 180 degrees. This changes the actuator's rotation in relation to the energization of the control valve. The figure below shows the dimensions for a valve with G1/4" and G1/2" ports. 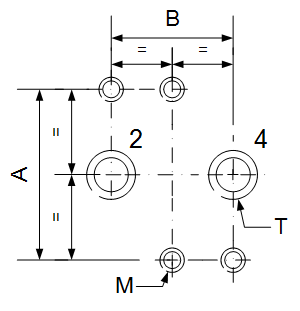 Dimensional drawing for the NAMUR standard flange.